Etched Communication, a Houston-based public relations agency, receives top honors for diversity from PR News. Etched operates as more than our outside PR agency, they are an extension of my internal team. They understand our mission to address the lack of diversity in the fashion industry and made it a priority to understand our audience. 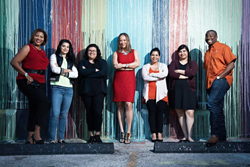 Nestled in the most ethnically diverse city in the U.S., boutique public relations firm Etched Communication was named an honoree in the first class of PR News’ Diversity in PR Awards for 2016. The Houston-based firm has hit the ground running since its 2013 inception, working with worldwide clients spanning industries including non-profit, food and beverage, music, manufacturing, education, government and law. Etched prides itself on a multi-cultural, client-centered approach. PR News hosts 11 elite award programs that bring to light top talent and creativity across the spectrum of the public relations and communications arena. This year marked the first-ever PR News’ Diversity in PR Awards. Open to domestic and international organizations, the Diversity in PR Awards are designed to recognize individual PR professionals, agencies, brands, government agencies, academic institutions, professional associations and nonprofit organizations that have demonstrated a commitment to diversity and excelled at communicating their diversity achievements. To celebrate the diversity of its clients and internal staff, Etched presents the corresponding Infographic commemorating the competitive advantage of diversity in the workplace. Etched Communication (Etched) is an award-winning integrated public relations and marketing firm based in Houston, serving clients worldwide. Etched cultivates progressive influence by tailoring every campaign to meet each client’s specific needs. Or team is infectiously passionate, perpetually driven, and unafraid to shatter conventional practices with blue sky concepts. Connect with Etched on Twitter, Facebook, and Instagram. The PR News Group at Access Intelligence, LLC is a daily intellectual hub that serves the communications and marketing community at corporations, agencies and nonprofits. The PR News group focuses on honing and growing PR practitioners' skills in social media, crisis management, digital PR, measurement, employee relations, media training, CSR and writing through its flagship newsletter, webinars, conferences, awards programs, workshops and guidebooks. With the launch of its weekly newsletter over 70 years ago, PR News has remained dedicated to supporting the growth of communicators all while keeping them abreast of the latest news affecting the industry.